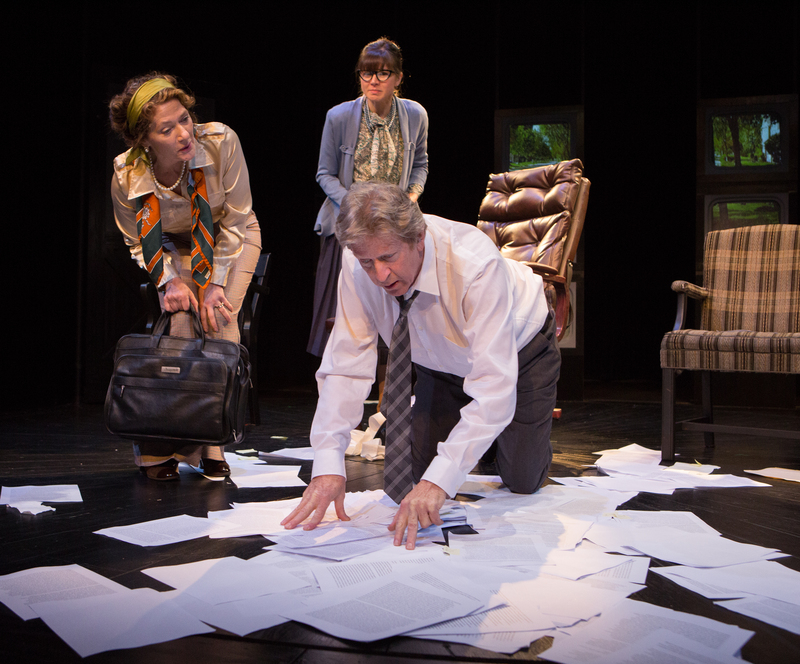 Sarah Orenstein’s Ethel (left) and Courtney Ch’ng Lancaster as Margaret (right) have different agendas as R.H. Thomson as Marshall McLuhan (centre) walk the fine line between genius and insanity in Tarragon Theatre’s brilliant staging of The Message, on stage until December 16, 2018. It’s no secret that actor R.H. Thomson has contributed equally to theatre what his central character Marshall McLuhan had done for media studies. You’re left with the impression that caretakers of thought can’t resist deep diving for truth and have a penchant for looking though things to see how it works giving both oracle statuses of their time. And in this age of information overload, the disappointing number of people who are ‘slaves’ to technology rather than ‘masters’, it’s an optimal time to revisit one of Canada’s sharpest intellectuals of the 20th century. With that said, Governor General award winning storyteller Jason Sherman razor sharp wit pays mesmerizingly beautiful homage to the man, they myth and the oracle that was steadfast that recognizing mass media change meant nothing when identifying its cause was everything. Was he set up to fall as he pushed the boundaries of thinking? It’s not hard to find yourself semi-lost at times in this daring drama that’s coherently scrambled at times giving director Richard Rose great latitude for visual brain games in taking his audience to the far reaches McLuhan’s rehabilitative state of mind. The post-peak portrait of McLuhan’s existence has immense historical value framing a man in decline, when ‘spreading the word’ is reduced to completing an unpublishable manuscript with a university review committee ardent on closing down the Centre that recognized the idea incubating professor for his varied achievements. With fanciful performances by Courtney Ch’ng Lancaster, Petter Hutt, Patrick McManus, and Sarah Orenstein at for an unbounded theatrical study at the precipice of a digital age, the show takes on additional meaning for our time. Break free from the robotics of life this month. If the medium is the message then The Message is clear: You cannot afford to miss out on this one.